In this article, you'll learn how to indicate that a student has taken an AP course/credit or has "tested-out" of one of your courses using transfer credits. Typically, this workflow will be used with new, incoming students who are in the later stages of the admissions process—so you'll need to make sure that the students you're working with have already been accepted and have the Student role. On the Profile > Student view, check to see if the student has a program listed. If there is, edit it to make sure the Is transfer student box is not checked. If not, add one according to the instructions in this article. Make sure to leave Is transfer... unchecked! 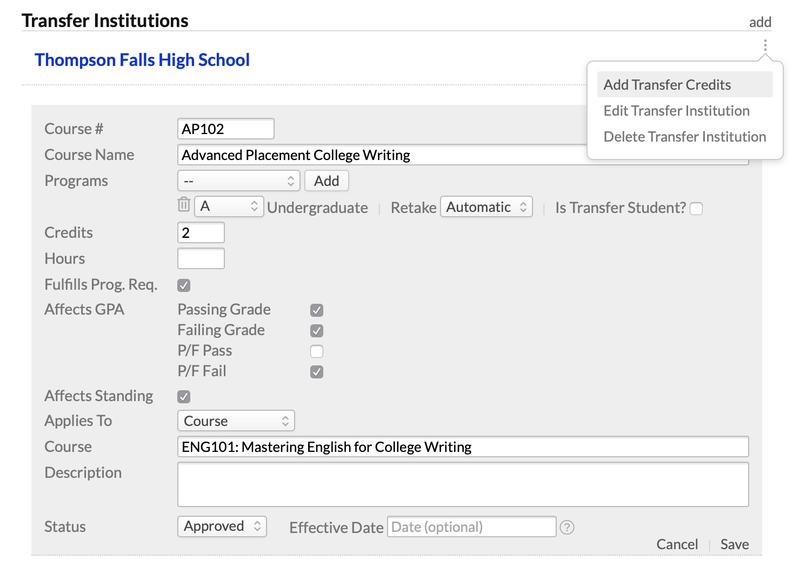 The program you select for the transfer course must match the most recent program on the Student view. When you set the status to Accepted, the Is transfer... checkbox will appear next to the program. Before saving, make sure you leave it un-checked. Go to the Profile > Student view. Un-check the Is transfer... box (or check it if you need it to go the other way). The transfer "course" will appear on the student's transcript. It will affect the student's program depending on the settings you chose for the course when adding it as a transfer credit. The student will not receive the Transfer system tag.